Lidl UK is the first supermarket to launch a game played through the Facebook Camera app in the UK. The ‘Emojional Rollercoaster’ game is available from today until 31st December on the Facebook Camera app. To support the launch of the game, the brand has partnered with national treasure Brian Blessed who stars in supporting social video content and voiceovers. Using AR technology, users can transform themselves into a ‘Sprouter or Doubter’ (a Brussels sprout), a ‘Pudding Perfectionist’ (a Christmas pudding), a ‘Cavalier Carver’ (a turkey) or Brian Blessed’s personal favourite, a ‘Mince Pie Maverick’ (a mince pie). To launch the game, Lidl has partnered with national treasure, actor Brian Blessed, who stars in supporting social video content and voiceovers. Developed by Lidl’s in-house social media team and digital marketing agency 360i, the launch sees Lidl utilise augmented reality (AR) for the first time, putting the user directly in the game and challenging them to make the same expression as the emojis appearing on screen. The game can be played as a single player or co-operatively with a friend; points are scored if the correct expression is achieved. Brian Blessed steps into this festive role naturally, providing animated voiceover instructions in a ‘How To’ video that will be hosted on the Lidl UK Facebook page from Monday. Viewers will be seamlessly directed to Lidl’s game and filters via a link within the ‘How To’ video. In his trademark booming voice and Hollywood style entertainment, Blessed proves that the ‘Emojional Rollercoaster’ is simple enough to be played by anyone on Facebook. Available from 11th to 31st December, everyone in the family can get involved in the game on Christmas Day… it’s sure to convert even the most resistant technophobes! 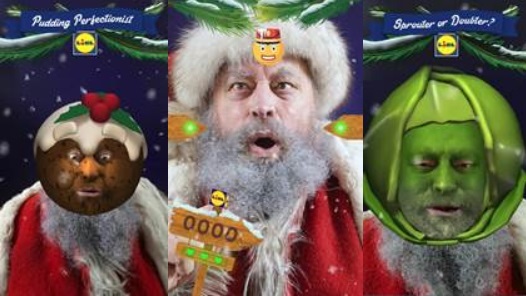 Lidl’s Emojional Rollercoaster game and festive filters will be available for free on the Facebook Camera app from 9am 11th December until 31st December.